After having us cycle along starry night bike paths, Dutch artist and innovator Daan Roosegaarde has now turned his attention to the power of water. Just over one quarter of the Netherlands is below sea level and the sea is kept at bay by a network of dykes, dams and other water defences. But what would happen if they weren’t there? 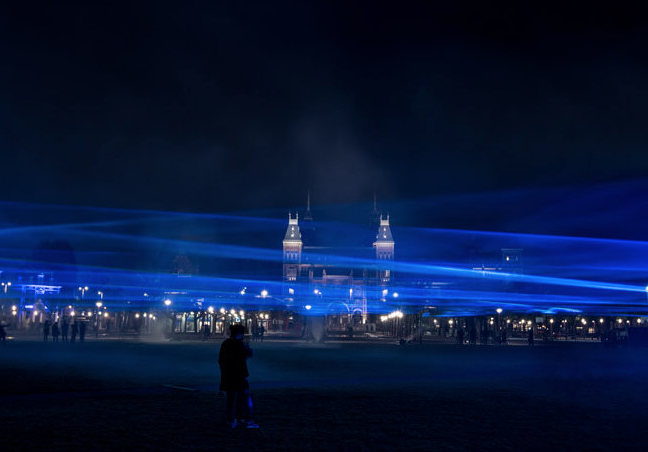 The installation Waterlicht consists of wavy lines of light made with the latest LED technology, software and lenses. It was created for the Dutch Rijn & IJssel waterboard and was at the Museumplein in Amsterdam for three nights earlier this month.